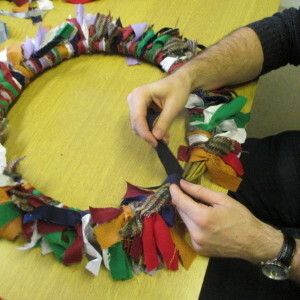 Wreaths have been made for thousands of years. 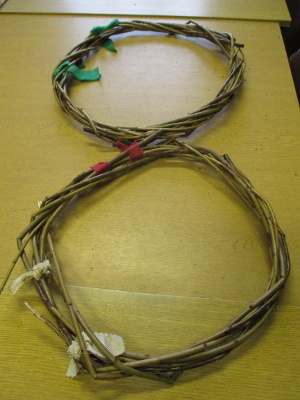 They were used by the Romans to decorate houses for the festival of Saturnalia, which was celebrated in December in honour of the Roman god of farming, Saturn. People would celebrate by feasting and gift giving and houses would be decorated with candles and wreaths of evergreen plants. 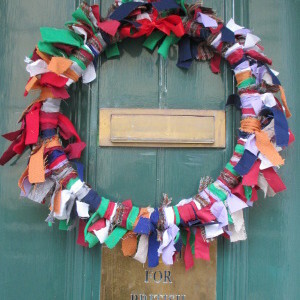 As Christianity became the main religion in Rome, people began to celebrate Christmas instead of Saturnalia but they kept a lot of the traditions, including wreaths. 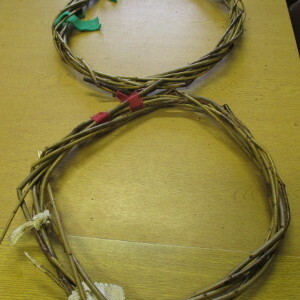 Making a wreath can be quite tricky and means cutting branches off plants. 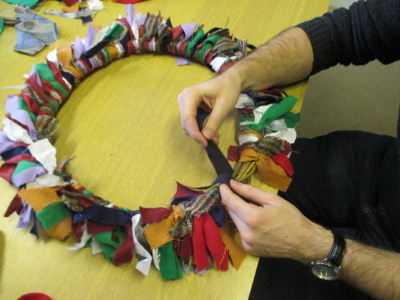 This activity will show you how you can make a modern version of a Christmas wreath. Ages : Suitable for all ages. 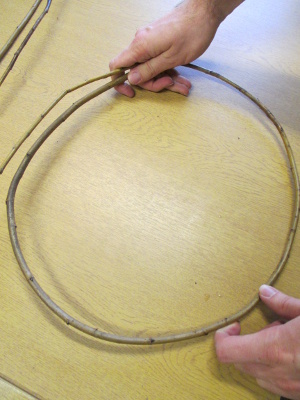 If you are using willow sticks, you will need to soak them so they bend easily. We put ours in the bath overnight. 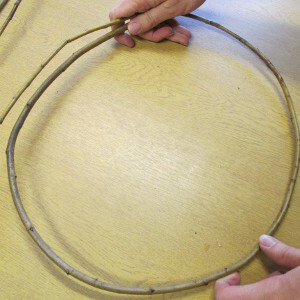 Bend one of the sticks into a circle. 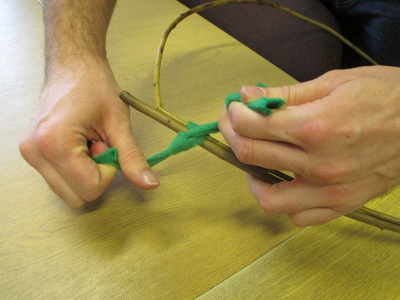 Go slowly and carefully but don’t worry if the end of the stick breaks off. 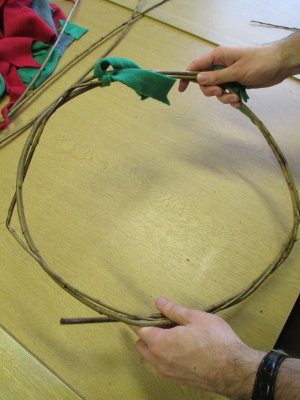 You can use secateurs to cut the sticks shorter for a smaller wreath but ask an adult to help. 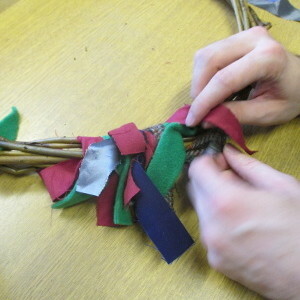 Use two strips of fabric to tie the ends of the stick together. 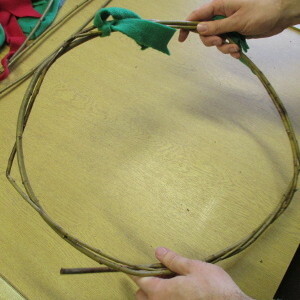 Take another stick and weave it through the first one, wrapping it over and under. 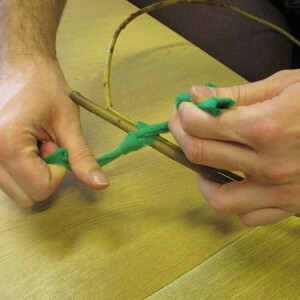 You might find it easier to leave the ends sticking out then tuck them in later. Do the same with the remaining sticks. 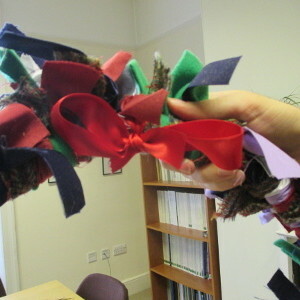 Try to start each new stick in a different place so your wreath is roughly the same thickness all the way around. 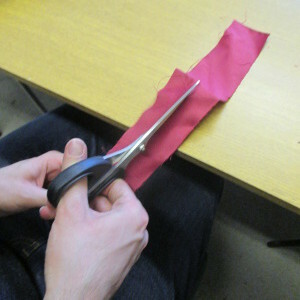 Cut the fabric into strips. These need to be long enough to tie around the frame you have made. 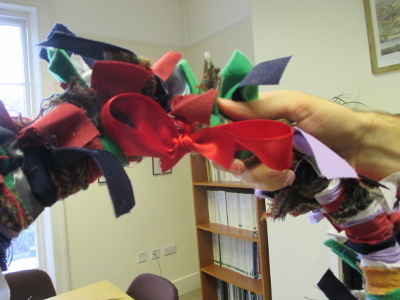 Don’t worry about making them all the same size – remember it’s supposed to be raggy! 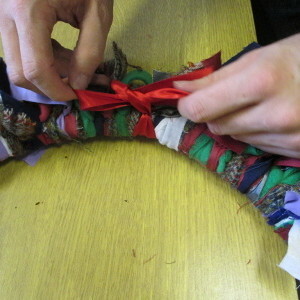 Start tying the strips of fabric around your frame. 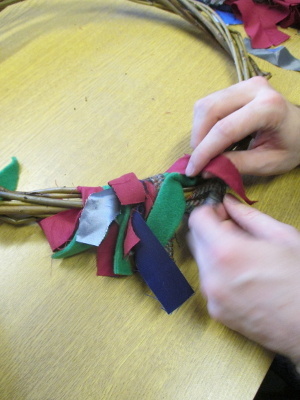 We’ve used lots of different colours but you might want to create a pattern. 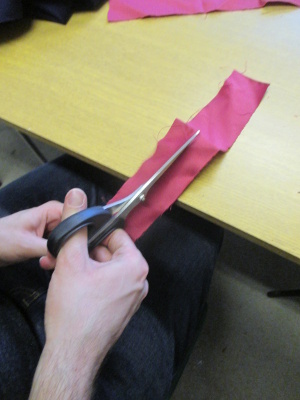 Push the strips of fabric together from time to time so they are closely packed. You shouldn’t be able to see any of the frame between them. Keep going until you’ve filled the whole circle. 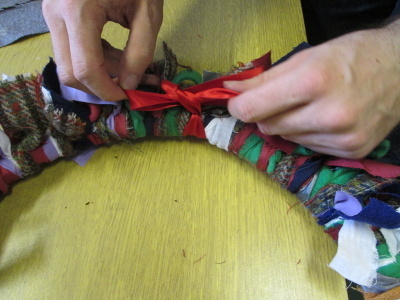 Tie the ribbon in a bow at the top of your wreath and tie a longer piece of fabric through this to make a loop for hanging it up. 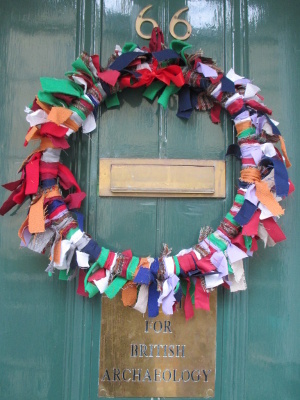 Hang the wreath on your door or somewhere else in your house.